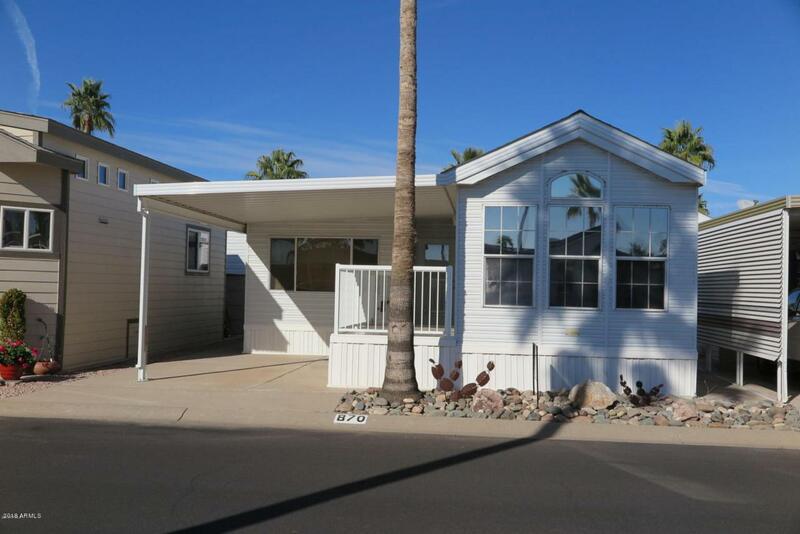 2005 Cavco w/AZ room 1.75 baths & laundry. Approx 800 sq. ft. Just steps from the clubhouse & all the fun at Golden Vista Resort! Beautiful tiled deck w/storage underneath. AZ room has picture window in front, sleeper sofa, recliner & newer TV, lg. laundry/hobby room, full bath & office closet. Bright living room w/sliding doors to deck in park model. Bay dining area w/hutch & cabinet. Kitchen features bay window at sink, full size stove, microwave & pantry. Walk in shower & linen closet at master bath. Lg. built in dresser, storage above bed & full mirrored closet in bedroom. Sunny back patio w/pavers. Attached storage closet w/water softener. AZ room is built above grade, fully insulated (R13 walls & R19 floors), 4'' thick foam roof, lg. water heater & laundry rm wired for fridge.